The early published literature on post–radiation therapy pathology in patients with prostate cancer is based on treatment with external beam radiation. However, brachytherapy techniques produce the same pathologic changes. About one quarter of men with prostate cancer choose radiotherapy. Prostate radiotherapy can be delivered by brachytherapy or external beam therapy or brachytherapy. In external beam therapy, a beam delivers radiation to the whole pelvis, with a boost to the prostate. In brachytherapy, interstitial radiation is delivered by implanted seeds containing a radioisotope (iodine-131 (131 I), iridium-192 [192 Ir], or gold-198 [198 Au]). In the nonneoplastic, irradiated prostate, nuclear enlargement and smudged chromatin are the most notable changes. This nuclear enlargement may be extreme, but no prominent secretory cell nucleoli exist. In cases in which the history of irradiation is not given or is uncertain, stromal and vascular changes can cue the pathologist to recognize radiation effect. 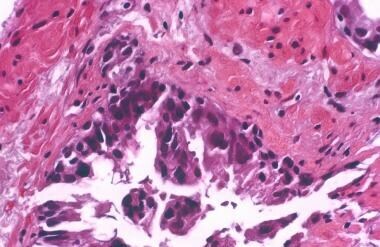 The stroma becomes fibrotic, and the cellularity of normal vessel walls (normal: left) increases because of smooth muscle proliferation (right). Histologic features of irradiated cancer and reactive prostate, however, can overlap, regardless of the form of radiotherapy. Thus, it is reasonable to label some cases as indeterminate or atypical suspicious acinar proliferation (ASAP), a designation applied to most of the 20% of nonnegative biopsies in one study. Microscopic findings following prostate irradiation are demonstrated in the images below. The preservation of at least a focal basal cell layer is a key finding (upper left). In basal cells, normally a single layer (left), nuclear enlargement can be found. The cells may become so hyperplastic that they form several layers and secretory cells are inconspicuous (right). Irregular, potato-shaped nuclei are pathognomonic for basal cells. Identification of irradiated cancer is a problematic area in pathology now that increased numbers of posttreatment biopsies are being performed. Early changes include cytomegaly, vacuoles, and nucleomegaly with persistent single, and occasionally double, nucleoli in each nucleus (left). 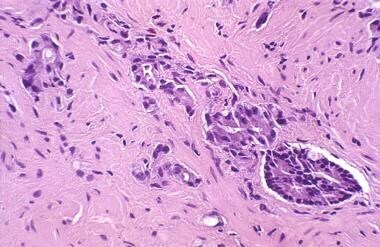 Later changes include atrophy and, sometimes, cytoplasmic vacuolation, with the nucleoli now being inconspicuous. In this matched set of photomicrographs from the same patient, compared with pretreatment grade 3 cancer (left), the main posttreatment change is atrophy (right). 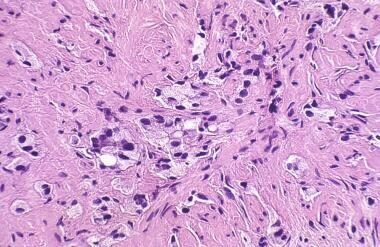 Note, however, the maintenance of infiltrative pattern, angulated acini, absence of basal cells, and inspissated luminal blue mucin characteristic of cancer. Depending on the duration of irradiation, one may see all atrophic cancer acini, unchanged acini, or a combination of atrophic and unchanged acini. Needle biopsy with postirradiation grade 3 cancer (left), a focus of high-grade prostatic intraepithelial neoplasia (PIN; center), and grade 4 cancer (right). 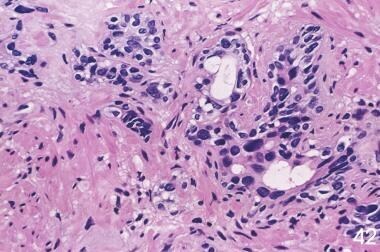 The residual neoplasm loses architectural differentiation while retaining the cytologic features of cancer. The acini are decreased in number and smaller in size, with a haphazard arrangement. In the grade 4 component of cancer, the acinar luminal structure breaks down; overgrading the apparent single cells as grade 5 is a temptation. The nucleoli have disappeared, indicating maximal effect. Some cases have increased Paneth cells (Siders, 1992). In this biopsy, high-grade prostatic intraepithelial neoplasia (PIN) with radiation effect is a helpful feature that should prompt a search for cancer. However, the frequency of PIN in irradiated prostate cancer (based on salvage prostatectomy findings) is decreased to 60% of cases (Cheng, 1998). In contrast, 82% of nonirradiated, step-sectioned prostates show high-grade PIN (McNeal, 1986). Preradiation expression of MIB-1  and TP53  predicts postradiation recurrence. Increased TP53 expression occurs after radiation, indicating that cells with abnormal overexpression were protected from cell death. TP53 expression in radioresistant cancer (postradiation) is less likely if patients receive neoadjuvant hormonal treatment. [11, 12] No significant changes in BCL2 or P21WAF1 are found. The recommended timing of a prostate biopsy after irradiation is a minimum of 1 year after completion of radiation therapy. This approach reliably discloses residual cancer. Biopsy samples should be taken from as many sites as possible. Crook et al reported that ultrasonographically guided biopsies beginning 12 months after radiation therapy revealed failure in 103 (21%) of 479 of patients; however, in 67 of these patients, biopsy results converted to negative after a mean of 28 months. Thus, the tumor may take up to 28 months to resolve. 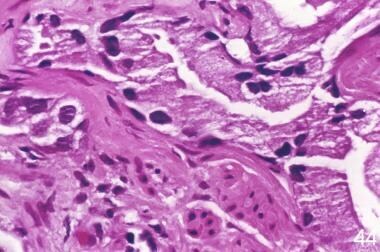 In a study of 160 patients, at a median 6.7-year follow-up, 21% of patients had a positive biopsy result. The radiation therapy failure rate has been found to be 25-90%, depending on whether failure is based on biochemical or biopsy evidence. Notably, in a study by Miller et al, 17% of patients with positive biopsy findings remained clinically free of disease at more than 10 years of follow-up. It has also been reported that in patients undergoing salvage radical prostatectomy after failure, recurrence was detected by biopsy after a mean of 3.5 (0.5-17) years. Potosky AL, Davis WW, Hoffman RM, et al. Five-year outcomes after prostatectomy or radiotherapy for prostate cancer: the prostate cancer outcomes study. J Natl Cancer Inst. 2004 Sep 15. 96(18):1358-67. [Medline]. Dugan TC, Shipley WU, Young RH, et al. Biopsy after external beam radiation therapy for adenocarcinoma of the prostate: correlation with original histological grade and current prostate specific antigen levels. J Urol. 1991 Nov. 146(5):1313-6. [Medline]. Prestidge BR, Hoak DC, Grimm PD, Ragde H, Cavanagh W, Blasko JC. Posttreatment biopsy results following interstitial brachytherapy in early-stage prostate cancer. Int J Radiat Oncol Biol Phys. 1997 Jan 1. 37(1):31-9. [Medline]. Iczkowski KA, Cheng L, Crawford BG, Bostwick DG. Steam-EDTA optimizes immunohistochemical expression of basal-cell specific anti-keratin 34bE12 to discriminate cancer in prostatic epithelium. Mod Pathol. 1998. 11:In press. Yang XJ, Laven B, Tretiakova M, et al. Detection of alpha-methylacyl-coenzyme A racemase in postradiation prostatic adenocarcinoma. Urology. 2003 Aug. 62(2):282-6. [Medline]. Martens MB, Keller JH. Routine immunohistochemical staining for high-molecular weight cytokeratin 34-beta and alpha-methylacyl CoA racemase (P504S) in postirradiation prostate biopsies. Mod Pathol. 2006 Feb. 19(2):287-90. [Medline]. Brawer MK, Nagle RB, Pitts W, Freiha F, Gamble SL. Keratin immunoreactivity as an aid to the diagnosis of persistent adenocarcinoma in irradiated human prostates. Cancer. 1989 Feb 1. 63(3):454-60. [Medline]. Crook J, Robertson S, Esche B. Proliferative cell nuclear antigen in postradiotherapy prostate biopsies. Int J Radiat Oncol Biol Phys. 1994 Sep 30. 30(2):303-8. [Medline]. Scalzo DA, Kallakury BV, Gaddipati RV, et al. Cell proliferation rate by MIB-1 immunohistochemistry predicts postradiation recurrence in prostatic adenocarcinomas. Am J Clin Pathol. 1998 Feb. 109(2):163-8. [Medline]. Grignon DJ, Caplan R, Sarkar FH, et al. p53 status and prognosis of locally advanced prostatic adenocarcinoma: a study based on RTOG 8610. J Natl Cancer Inst. 1997 Jan 15. 89(2):158-65. [Medline]. Rakozy C, Grignon DJ, Sarkar FH, Sakr WA, Littrup P, Forman J. Expression of bcl-2, p53, and p21 in benign and malignant prostatic tissue before and after radiation therapy. Mod Pathol. 1998 Sep. 11(9):892-9. [Medline]. Bian SX, Kuban DA, Levy LB, et al. Addition of short-term androgen deprivation therapy to dose-escalated radiation therapy improves failure-free survival for select men with intermediate-risk prostate cancer. Ann Oncol. 2012 Feb 21. [Medline]. Jackson W, Hamstra DA, Johnson S, Zhou J, Foster B, Foster C, et al. Gleason pattern 5 is the strongest pathologic predictor of recurrence, metastasis, and prostate cancer-specific death in patients receiving salvage radiation therapy following radical prostatectomy. Cancer. 2013 Sep 15. 119(18):3287-94. [Medline]. Lilleby W, Stensvold A, Mills IG, Nesland JM. 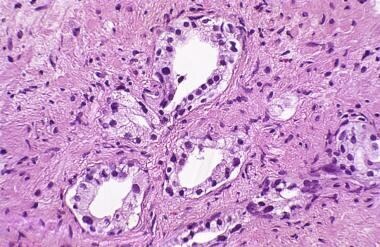 Disseminated tumor cells and their prognostic significance in nonmetastatic prostate cancer patients. Int J Cancer. 2013 Jul. 133(1):149-55. [Medline]. Stone NN, Unger P, Crawford ED, Stock RG. Diagnosis and management of local recurrence after low-dose-rate brachytherapy. Brachytherapy. 2014 Sep 16. [Medline]. Barchetti F, Panebianco V. Multiparametric MRI for recurrent prostate cancer post radical prostatectomy and postradiation therapy. Biomed Res Int. 2014. 2014:316272. [Medline]. [Full Text]. Johnstone PA, Riffenburgh R, Saunders EL, Willison FW. Grading inaccuracies in diagnostic biopsies revealing prostatic adenocarcinoma: implications for definitive radiation therapy. Int J Radiat Oncol Biol Phys. 1995 May 15. 32(2):479-82. [Medline]. Bostwick DG. Gleason grading of prostatic needle biopsies. Correlation with grade in 316 matched prostatectomies. Am J Surg Pathol. 1994 Aug. 18(8):796-803. [Medline]. Cheng L, Sebo TJ, Slezak J, et al. Predictors of survival for prostate carcinoma patients treated with salvage radical prostatectomy after radiation therapy. Cancer. 1998 Nov 15. 83(10):2164-71. [Medline]. Siders DB, Lee F. Histologic changes of irradiated prostatic carcinoma diagnosed by transrectal ultrasound. Hum Pathol. 1993. 23:344-51. Wheeler JA, Zagars GK, Ayala AG. Dedifferentiation of locally recurrent prostate cancer after radiation therapy. Evidence for tumor progression. Cancer. 1993 Jun 1. 71(11):3783-7. [Medline]. Bostwick DG, Egbert BM, Fajardo LF. Radiation injury of the normal and neoplastic prostate. Am J Surg Pathol. 1982 Sep. 6(6):541-51. [Medline]. Crook JM, Bahadur YA, Perry GA, Malone SC, Robertson SJ. Radiotherapy for prostate cancer: results of systematic biopsies for 479 patients [abstract]. J Urol. 1998. 159 [suppl]:64. Zapatero A, Minguez R, Nieto S, Martin de Vidales C, Garcia-Vicente F. Post-treatment Prostate Biopsies in the Era of Three-Dimensional Conformal Radiotherapy: What Can They Teach Us?. Eur Urol. 2008 May 7. [Medline]. Miller EB, Ladaga LE, el-Mahdi AM, Schellhammer PF. Reevaluation of prostate biopsy after definitive radiation therapy. Urology. 1993 Apr. 41(4):311-6. [Medline]. Marinelli D, Shanberg AM, Tansey LA, et al. Followup prostate biopsy in patients with carcinoma of the prostate treated by 192iridium template irradiation plus supplemental external beam radiation. J Urol. 1992 Mar. 147(3 Pt 2):922-5. [Medline]. Cheng L, Cheville JC, Pisansky TM, et al. Prevalence and distribution of prostatic intraepithelial neoplasia in salvage radical prostatectomy specimens after radiation therapy. Am J Surg Pathol. 1999 Jul. 23(7):803-8. [Medline]. Morton GC, Loblaw DA, Chung H, Tsang G, Sankreacha R, Deabreu A, et al. Health-related quality of life after single-fraction high-dose-rate brachytherapy and hypofractionated external beam radiotherapy for prostate cancer. Int J Radiat Oncol Biol Phys. 2011 Aug 1. 80(5):1299-305. [Medline]. Haugnes HS, Melby B, Larsen KM, et al. Assessment of late urinary, bowel and sexual function after dose escalation from 70 to 76 Gy using image-guided radiotherapy in curative treatment of prostate cancer. Scand J Urol Nephrol. 2012 Feb 22. [Medline].